Our Rousseau industrial shelving is strong, durable, and easily adapts to your requirements thanks to a variety of accessories available such as: wire spool supports, tool rails, clothes-hanger supports, and more. With the diverse dimensions available for our industrial shelving, it can be adapted to almost any building structure, no matter what architectural obstacles may exist. You can also take advantage of unused overhead space by installing our two-level shelving system. 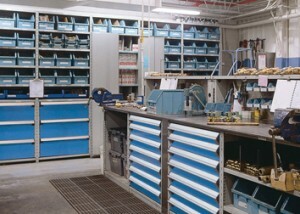 For better control, or taking of inventory, for receiving material, or virtually any other task, industrial workstations and benches adapt to your needs. In addition, our computer cabinet is equipped to protect your equipment from dust and heat. For your future needs, you can at any time easily reconfigure Rousseau accessories to adapt to your evolving workspace. When you opt for the industrial shelving system, your employees’ productivity is improved while they benefit from an ideal work environment. When you combine industrial shelving, modular drawers and mini-racking (bulk storage racking), you are making the most of the Rousseau system. By adding modular drawer to your shelves you can recuperate up to 70% of floor space that would have initially been outfitted with shelving only. When you combine Mini-racking (bulk storage racking) with shelving, you facilitate storage of bulky or heavy items. Using the two-level shelving system gives you the advantage of a hybrid system (combining industrial shelving, modular drawers and Mini-Racking), to make the most of unused overhead space. At Grace Material Handling we can show you how Rousseau products will respond to your needs.